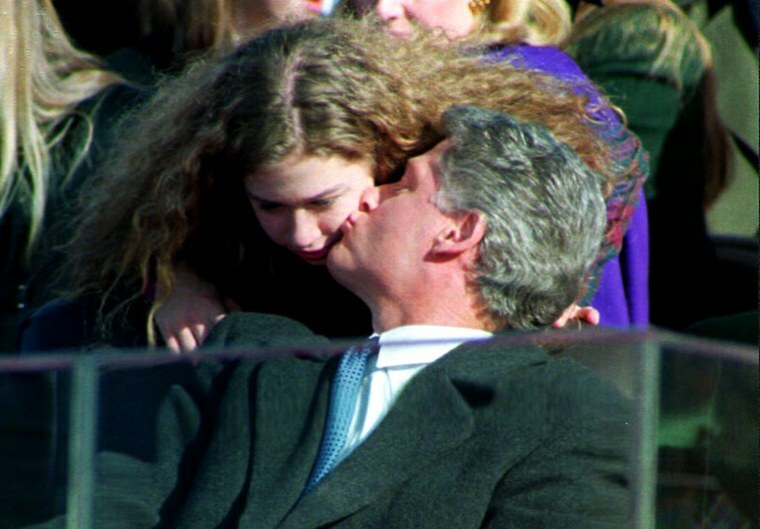 Daughter of a president and a Secretary of State, the only child of Bill and Hillary Clinton has grown up in the public eye. 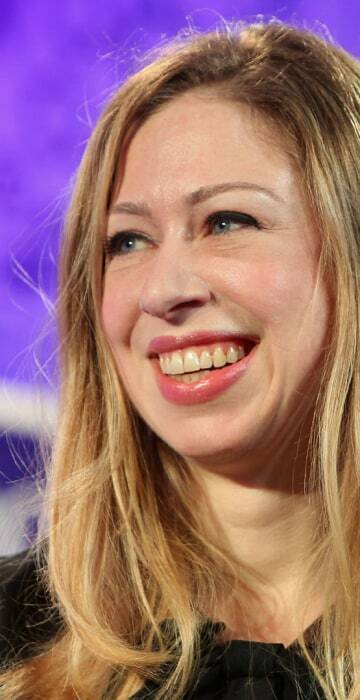 The only child of former president Bill Clinton and current Secretary of State Hillary Rodham Clinton, Chelsea Clinton has grown up in the public eye. 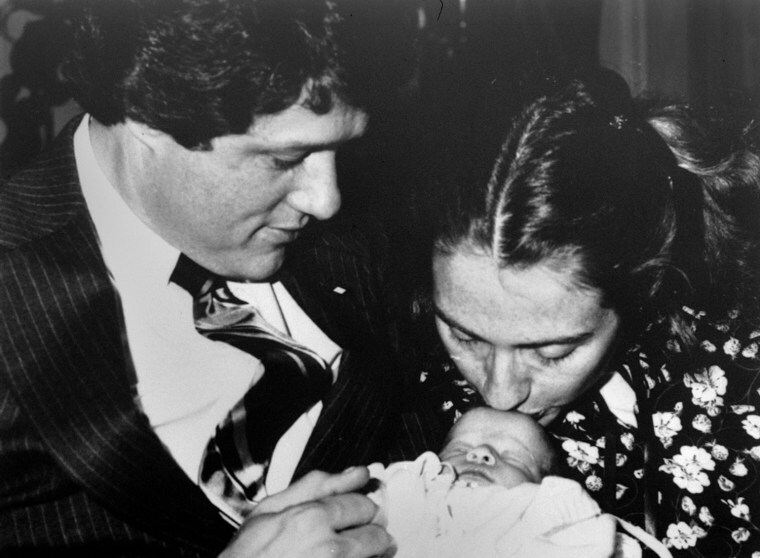 Here she is with her parents at the age of 1 week on March 5, 1980, when her father was governor of Arkansas. Her name came from the Joni Mitchell song "Chelsea Morning." 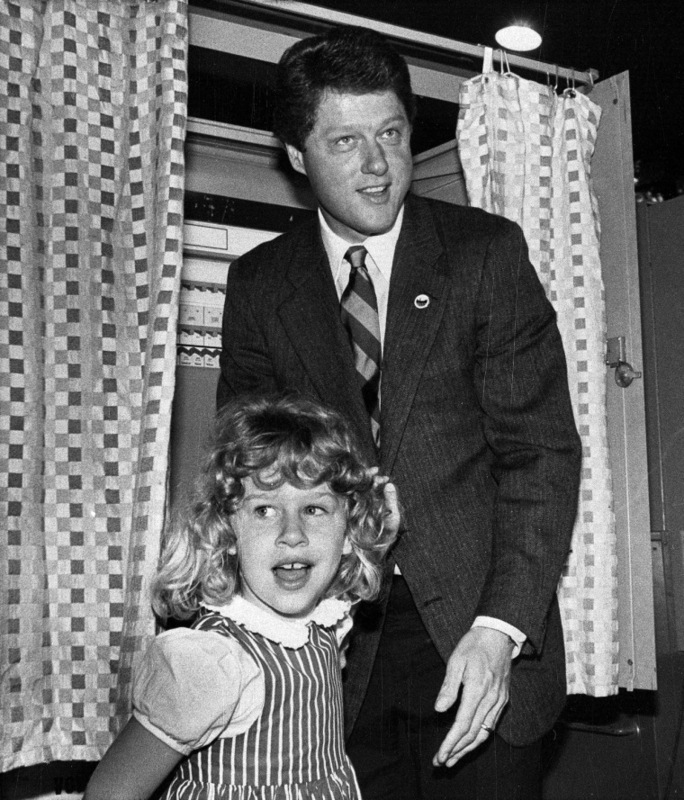 Chelsea was 6 when she joined her father in the voting booth during the Democratic primary in Little Rock, Ark., on May 27, 1986. Then-governor Bill Clinton was being challenged by former Arkansas governor Orval Faubus and W. Dean Goldsby -- unsuccessfully, it turned out. 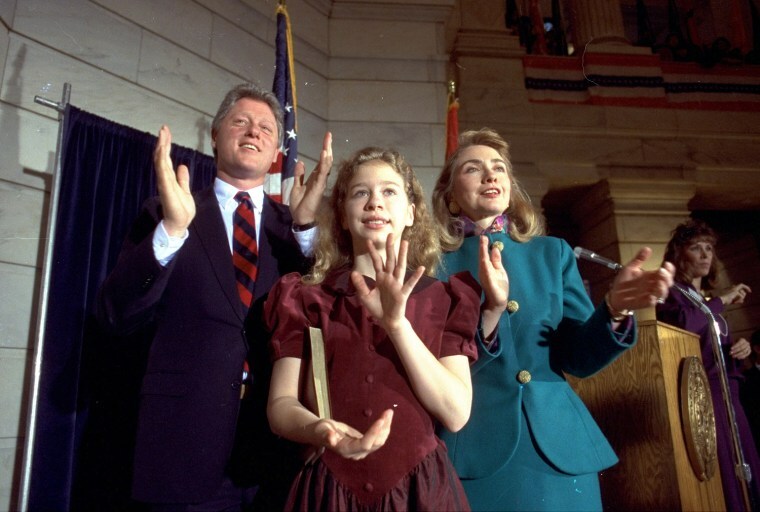 At age 11, Chelsea Clinton joined her father and mother in applauding her dad's inauguration to a new term as Arkansas governor on Sept. 20, 1991, in Little Rock. Chelsea Clinton holds her father's arm and hand at the end of the Democratic National Convention in New York City, Thursday, July 16, 1992. Bill Clinton would go on to win the White House that November. 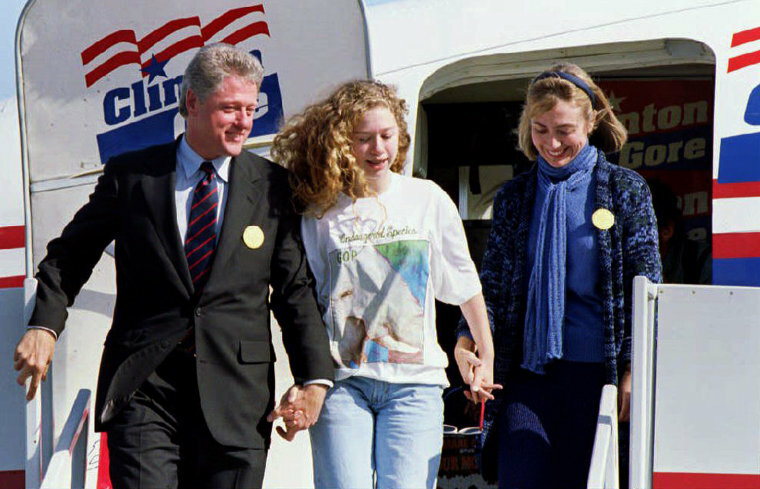 Chelsea, 12 years old, arrives with her father and mother in Little Rock, Ark., on Nov. 3, 1992 -- Election Day. On that day, Bill Clinton defeated incumbent George H.W. Bush for the U.S. presidency. 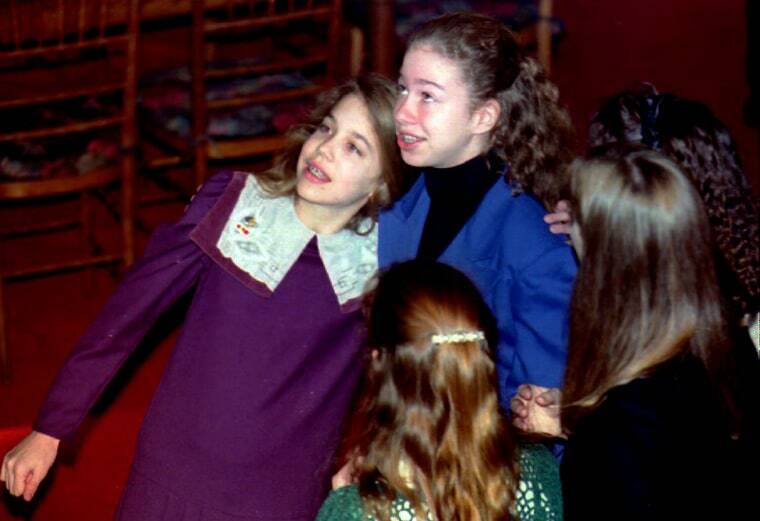 Chelsea Clinton, just shy of 13, hugs school friend Elizabeth Fleming during the "Faces of Hope" luncheon on Jan. 18, 1993 at the Folger Library in Washington, D.C.
Bill Clinton kisses daughter Chelsea just before being sworn in as 42nd President of the United States on Jan. 20, 1993. Just a few days after her father captured the White House, Chelsea Clinton was out on the soccer field on Jan. 28, 1993. 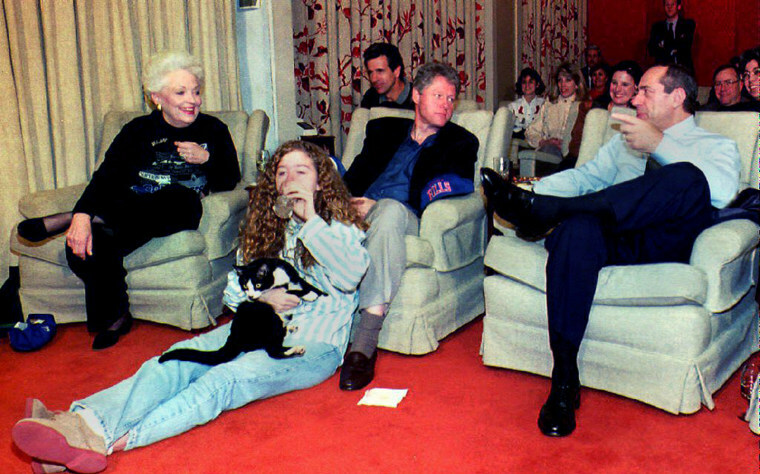 On Jan. 31, 1993, Chelsea, her father, and her cat, Socks, watched Super Bowl XXVII at the White House. Joining them were Texas governor Ann Richards (left) and New York governor Mario Cuomo (right). 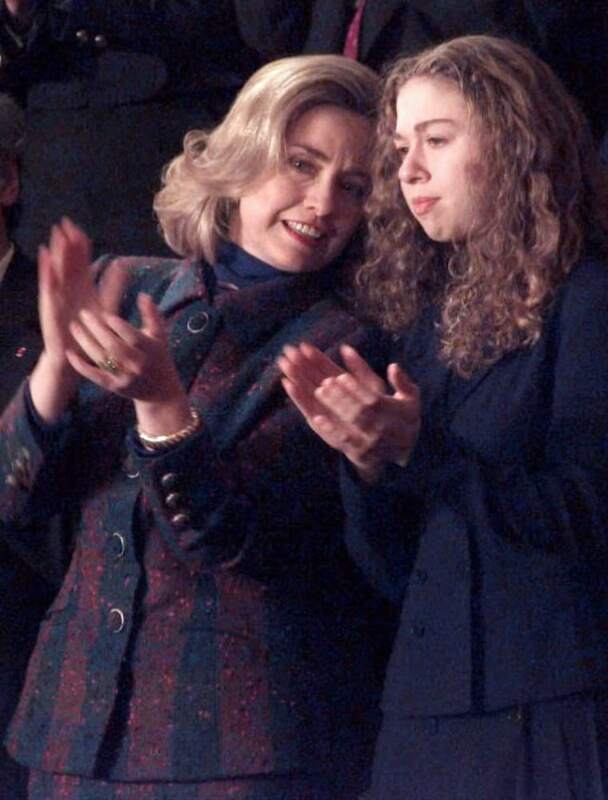 First lady Hillary Clinton has a word for her daughter Chelsea during the introduction of President Bill Clinton's State of the Union address on Jan. 23, 1996. In December 1993, Chelsea helped her mom and dad press the button lighting the national Christmas tree. A 16-year-old Chelsea Clinton sits with friend Marc Mezvinsky while watching a football game on the beach at Hilton Head Island, S.C., in December 1996. 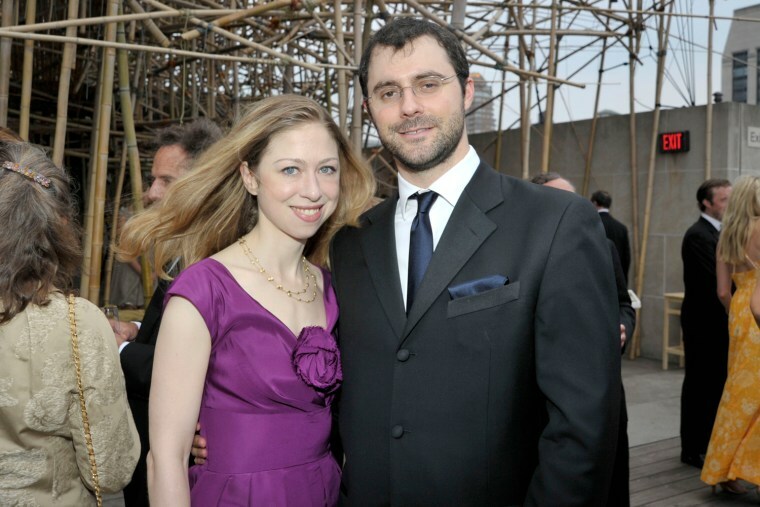 Mezvinsky is the son of former Iowa congressman Edward Mezvinsky and former Pennsylvania congresswoman Marjorie Margolies-Mezvinsky -- and Chelsea's fiance in 2009. 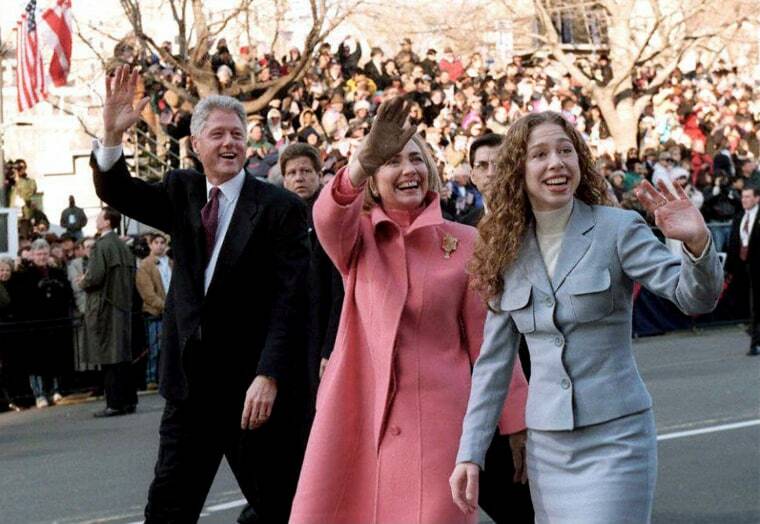 Chelsea joined her father and mother in the inaugural parade on Jan. 20, 1997 as Bill Clinton began his second term as U.S. president. Chelsea Clinton rehearses with the Washington Ballet in May 1997. She began taking ballet lessons at the Washington School of Ballet in 1993 and was on the board of the School of American Ballet. Chelsea Clinton joins her father jogging on Martha's Vineyard in August 1997. 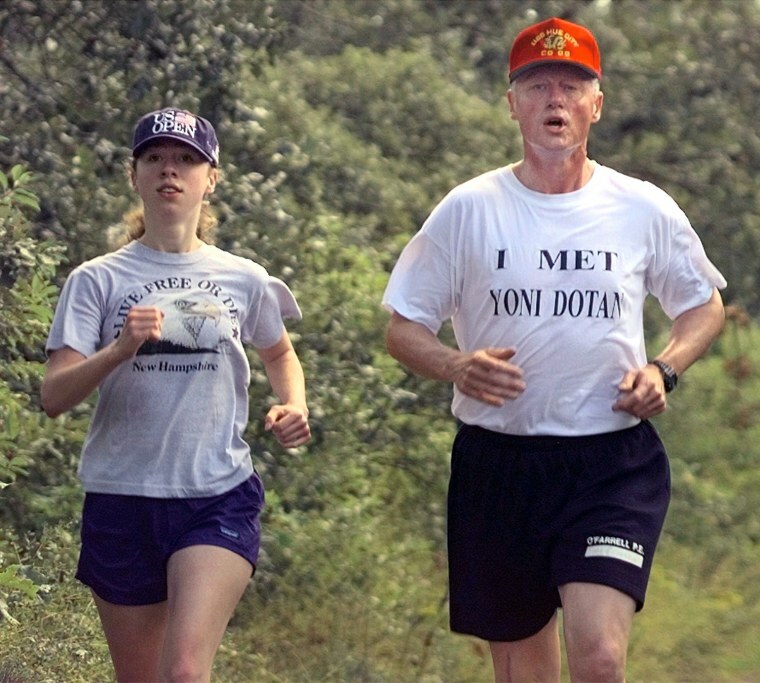 It was Bill Clinton's first public jog since undergoing surgery on his knee. 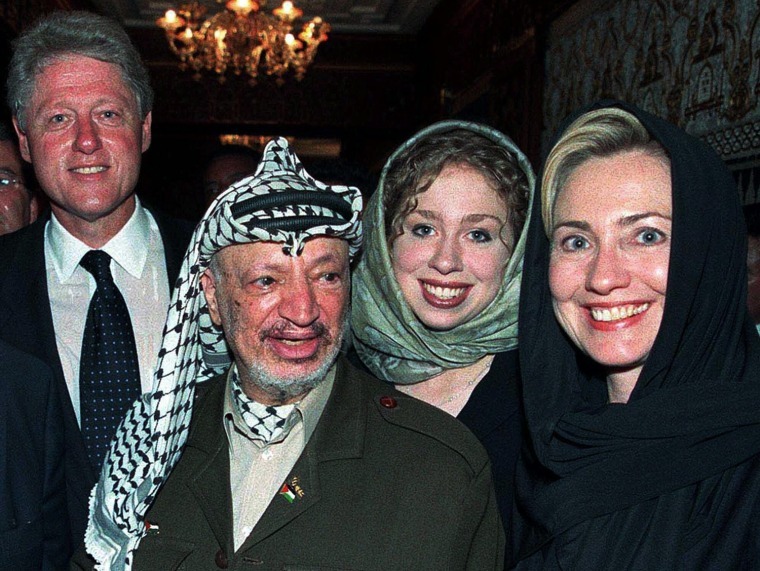 In July 1999, Chelsea Clinton joined her parents and Palestinian leader Yasser Arafat in Rabat, Morocco for the funeral of that nation's King Hassan II. 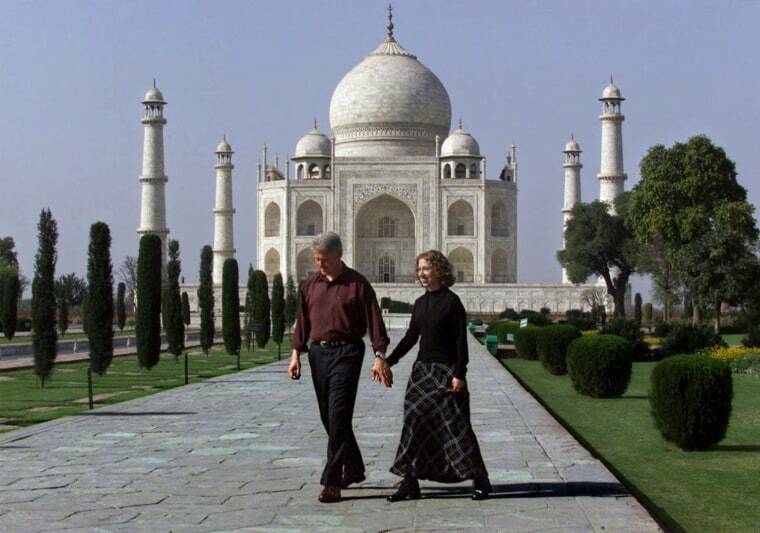 Chelsea Clinton takes the hand of her father as they walk past the gardens of the Taj Mahal in Agra, India, in March 2000, on a trip that combined matters of state with sightseeing. Chelsea joins her parents in a hug after President Clinton delivered a speech to the Democratic National Convention at the Staples Center in Los Angeles in August 2000. 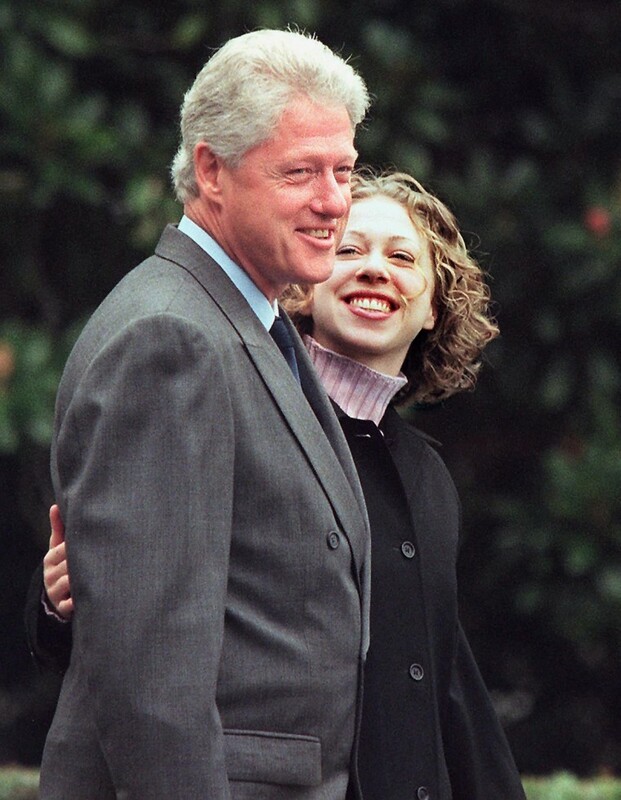 President Bill Clinton and daughter Chelsea walk from the White House to a waiting helicopter in October 2000. The president was on his way to New York for fund-raising events for his wife, Hillary Rodham Clinton, who was running for a New York Senate seat. Chelsea Clinton exits the voting booth after casting her vote at Douglas Grafflin Elementary School in Chappaqua, New York in November 2000. Later that day, the Clinton family held a rally in downtown New York City later to celebrate the Senate candidacy of first lady Hillary Rodham Clinton. 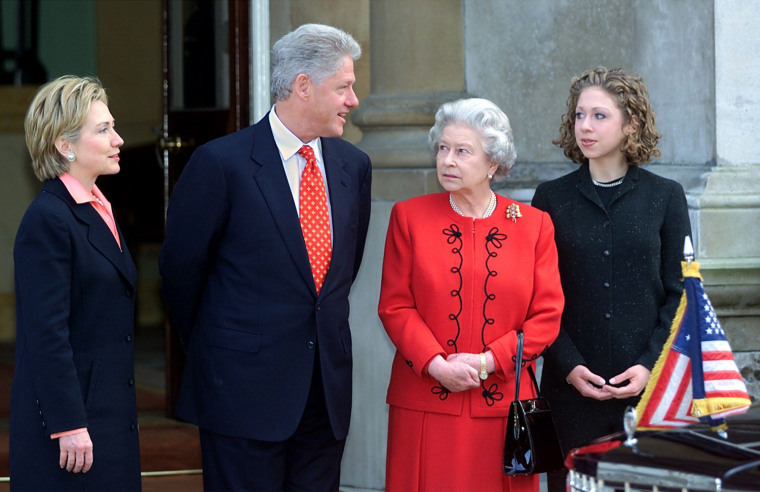 Chelsea Clinton joins her parents for a visit with Queen Elizabeth II at Buckingham Palace in December 2000. The Clintons had tea with the queen as they wrapped up a three-day trip to Ireland, North Ireland and the United Kingdom. 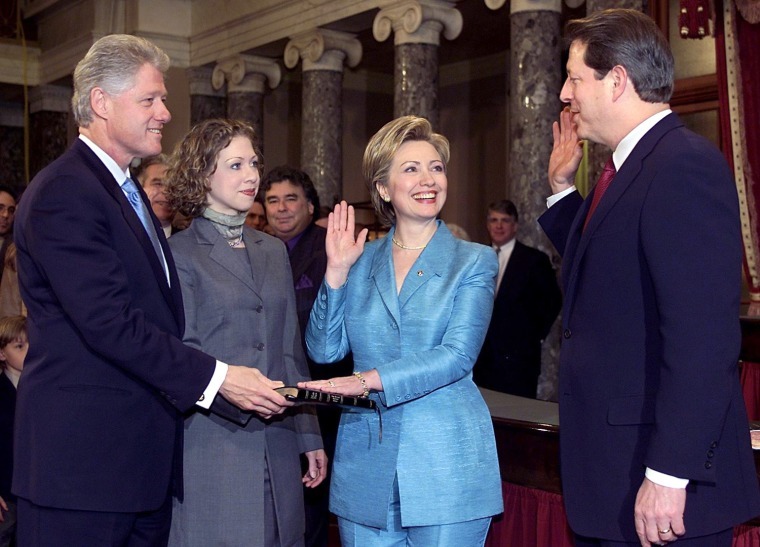 Chelsea Clinton and her father, President Clinton, were on hand as her mother, Hillary Rodham Clinton, was sworn in as a Senator by Vice President Al Gore on Jan. 3, 2001. 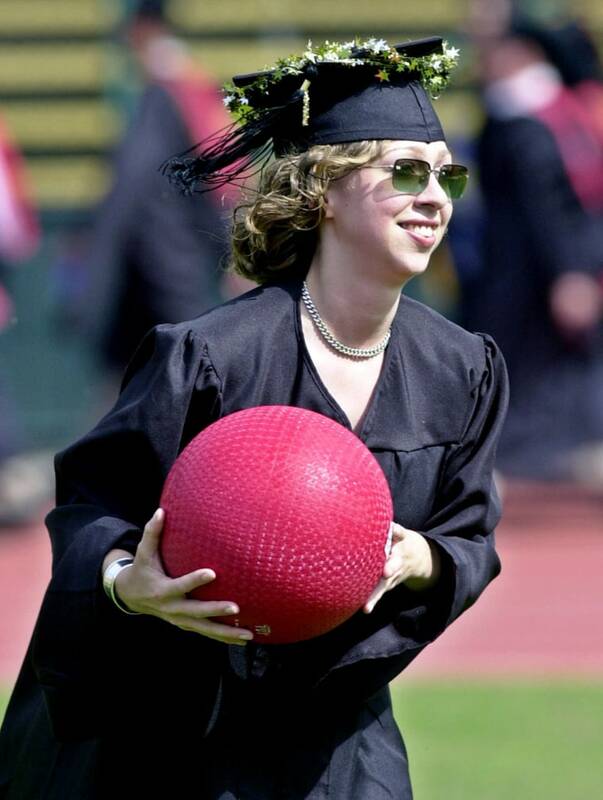 Chelsea Clinton plays with friends during her Stanford University graduation on June 17, 2001. 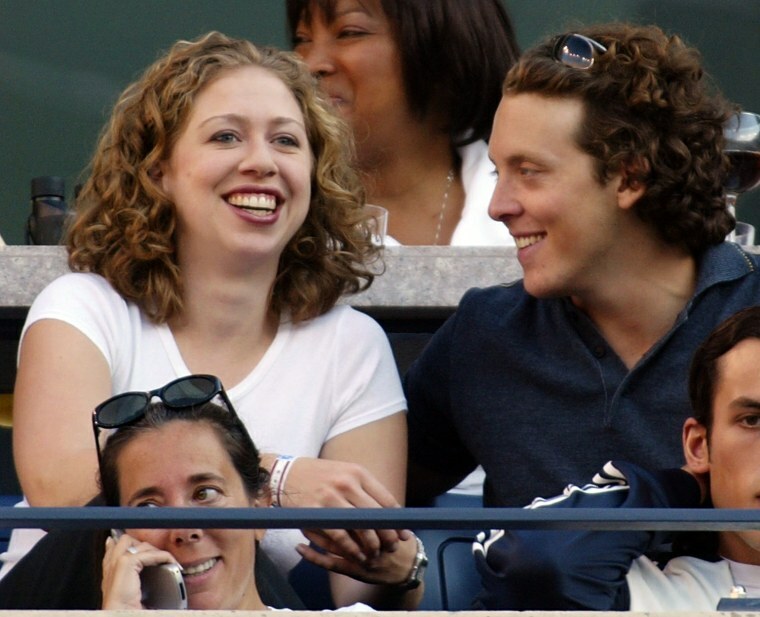 Chelsea Clinton and then-boyfriend Ian Klaus attended the US Open Tennis Tournament at Flushing Meadows, N.Y. in September 2002. Clinton and Klaus dated for three years, but broke up in 2005. Chelsea Clinton and her father, now a former president, watch Senator Hillary Clinton at a New York City rally in June 2008, during the senator's unsuccessful run for the Democratic presidential nomination. 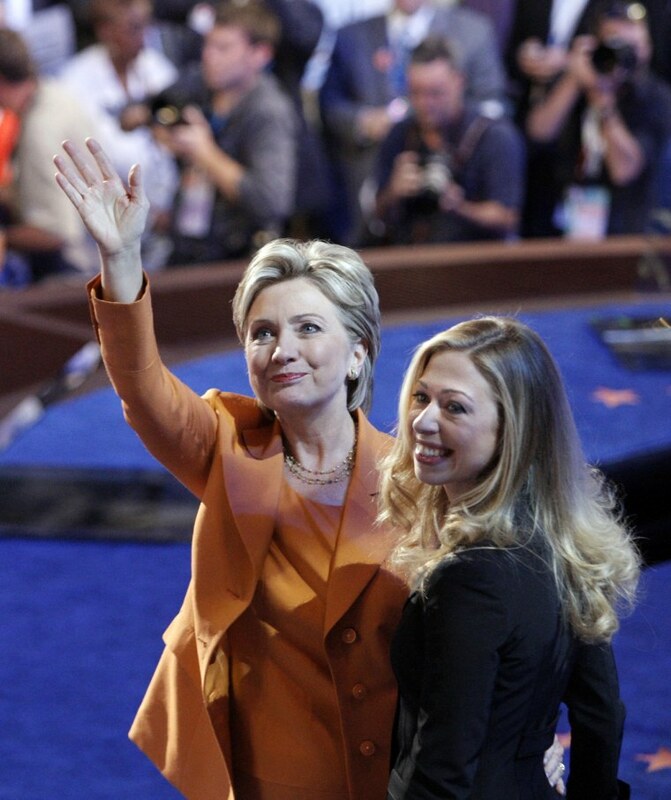 Chelsea Clinton is at the side of her mother, Sen. Hillary Rodham Clinton, after introducing her at the Democratic National Convention in Denver on Aug. 26, 2008. 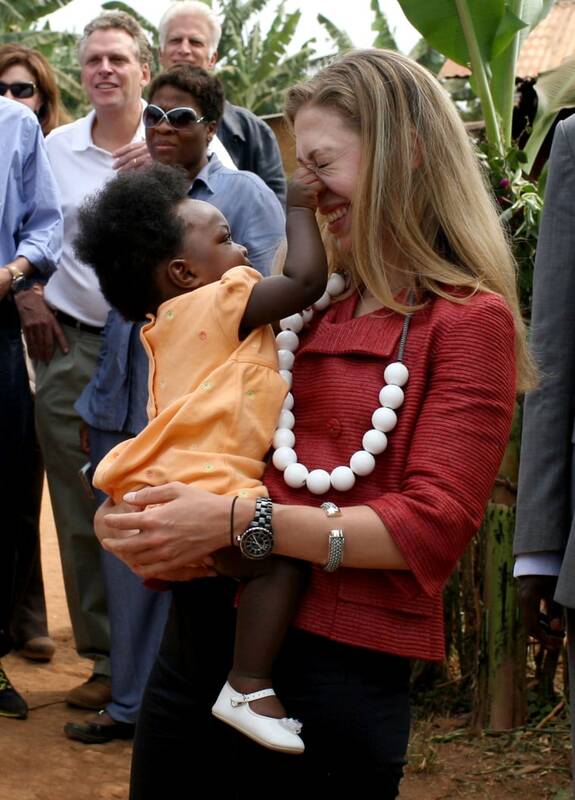 A baby pinches Chelsea Clinton's nose as she and her father visit a rural healthcare clinic in Rwinkwavu, Rwanda, in August 2008. 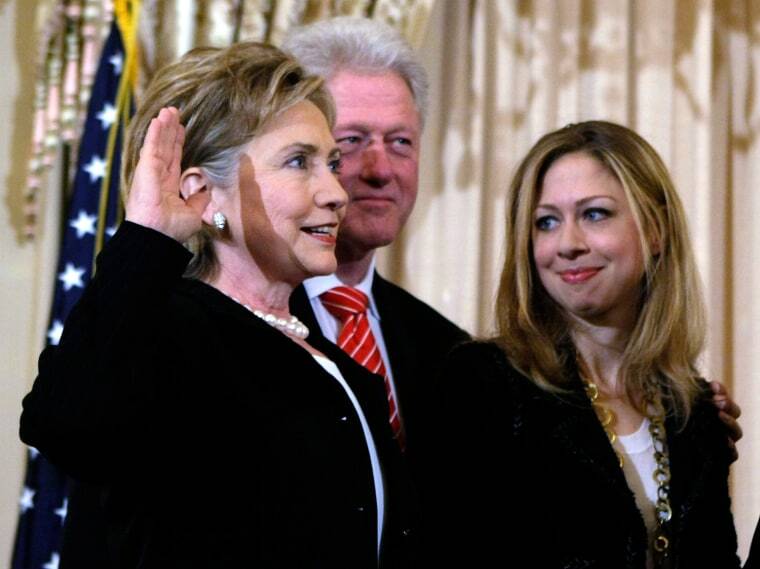 Chelsea Clinton and her father look on proudly as Hillary Rodham Clinton is sworn in as Secretary of State on Feb. 2, 2009. Chelsea Clinton and longtime beau Marc Mezvinsky shop in New York City in April of 2006. The couple got engaged over the 2009 Thanksgiving holidays, according to a spokesman for former president Bill Clinton. The couple will be married in the summer of 2010. Chelsea Clinton attends a party for top winery Chateau Haut-Brion, accompanied by her groom-to-be, Marc Mezvinsky. The event was thrown by Prince Robert of Luxembourg to commemorate his great-grandfather’s purchase of the wine estate 75 years ago. 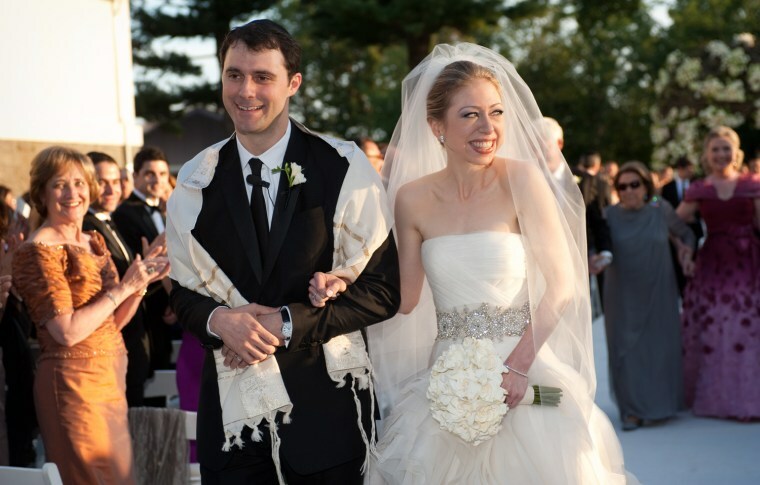 Chelsea weds Marc Mezvinsky at the Astor Courts Estate on July 31, 2010 in Rhinebeck, N.Y. The interfaith ceremony was held at the estate built by John Jacob Astor on the Hudson River. Sandra Fluke, Nicole Wallace, Cindi Leive, Stephanie Schriock, Abby Huntsman Livingston, Amy Holmes, Chelsea Clinton and Christine Quinn attend the Women In Politics Panel With Chelsea Clinton hosted by Glamour magazine on March 28, 2012 in New York. Chelsea Clinton visits with school children at the Building Tomorrow Academy of Gita, about an hour outside of Uganda's capital of Kampala on July 20, 2012. 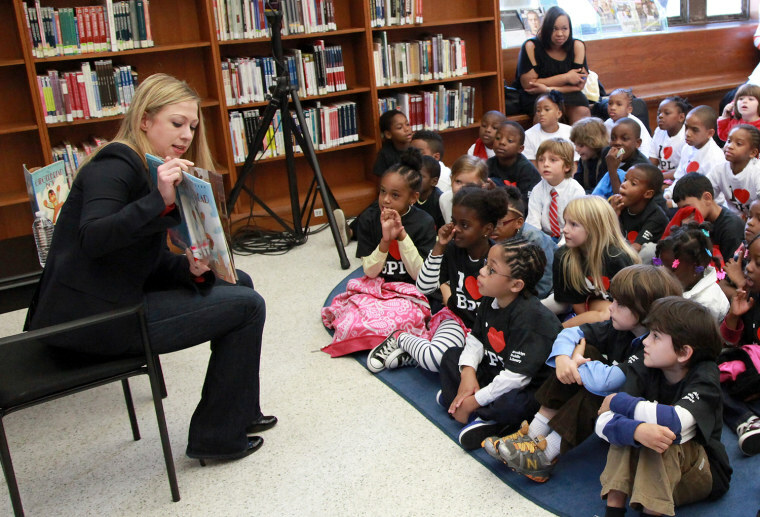 Chelsea Clinton reads to children during Chelsea Clinton Story Time Reading at the Brooklyn Public Library in 2012. 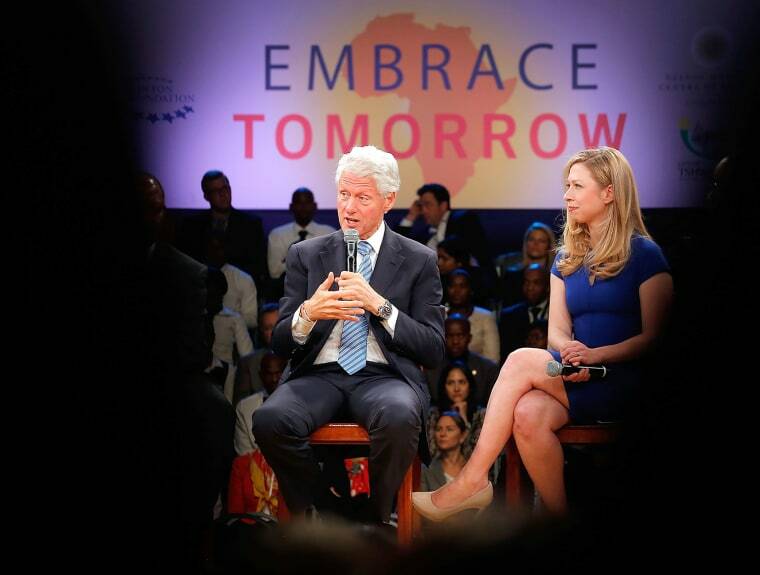 Chelsea Clinton looks on as her father, former president and founder of the Clinton Foundation, speaks onstage during the 'Embrace Tomorrow - A Conversation Without Borders' program in 2013. 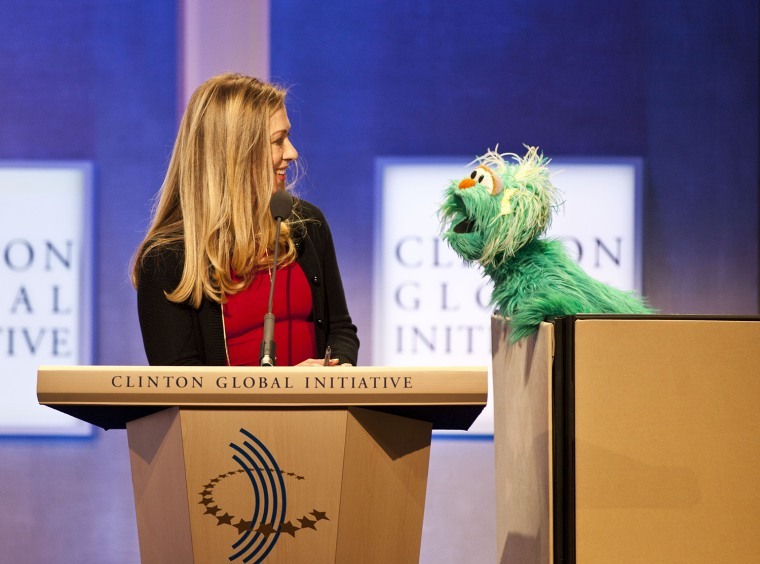 Chelsea Clinton speaks with Rosita the muppet from Sesame Street during the annual Clinton Global Initiative meeting on September 24, 2013. 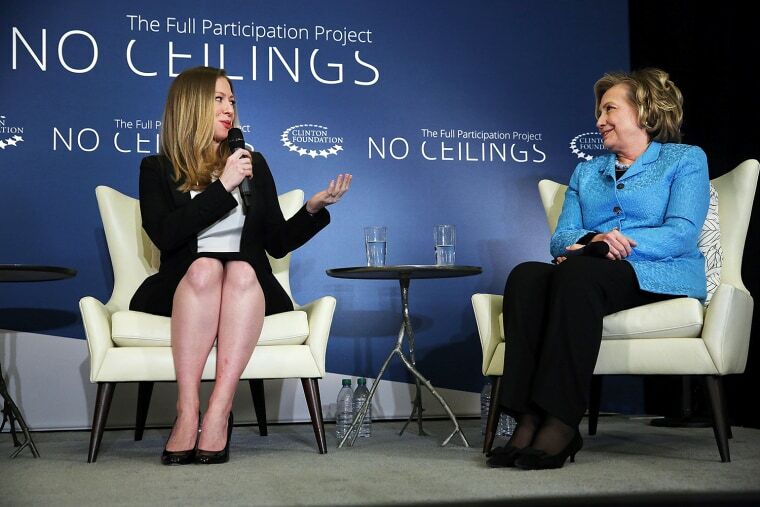 Hillary Rodham Clinton shares the stage with Chelsea while speaking at the Clinton Foundation's No Ceilings: The Full Participation Project at the Lower Eastside Girls Club on April 17, 2014 in New York. 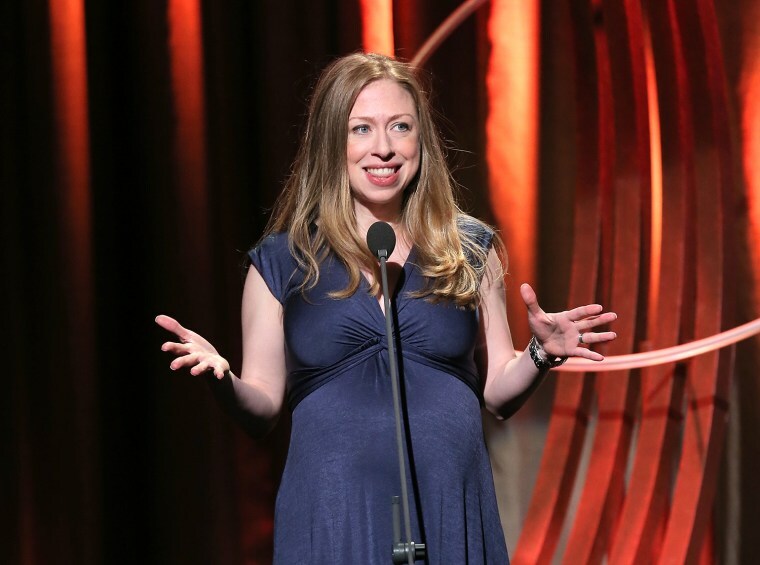 Chelsea Clinton speaks during the 8th Annual Clinton Global Citizen Awards at Sheraton Times Square on September 21, 2014 in New York.